If you are looking to build connections and/or establish affiliations or joint ventures with Kentucky hospitals to better assist them in fulfilling their responsibilities in a cost-effective manner, you’ll want to choose a sponsorship level that fits your needs. 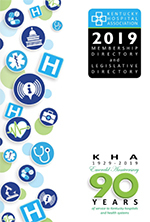 KHA’s wide range of sponsorship levels provide you access to the leadership of the state’s 131 hospitals which are responsible for the employment of 82,000 full and part-time workers and the care of patients through the provision of lifesaving services. There are several levels of sponsorship from which to choose. The benefits are outlined in the brochure. Please complete the sponsorship application and return as soon as possible to take full advantage of the annualized benefits and opportunities, which include select exposure at the KHA Annual Convention. For further information, contact Claire Arant.